Choose between one-of-a-kind and varied dorm options that allow you just the right amount of privacy while staying within your budget. Each bed features at least one charging outlet, a private light, and a locker with a lock. Besides having inside and outside common areas, hot showers, and a fully equipped kitchen, we offer rare perks as a TV with Netflix, free towel use and a comfy terrace with a day bed to work on your tan or enjoy a starry night. Our common areas - including the kitchen - are open to guests 24/7 and we have no rules on outside food/drinks, so make yourself at home! Finally, as a thank you for choosing us, we are 1 of 2 hostels in the whole city that grant you a guest card for discounts at our favorite places in town! Good location close to plenty of food options, things to do and sights. Staff was awesome, facilities are clean and atmosphere is very relaxed. Could easily spend a few days here. The dorms are nice and bunks private with a curtain. Great little extra touch. 10/10 facility and 20/10 staff and people! I absolutely loved staying here and would definitely stay here again if I come back to Antigua again! I Love Somos! I stay whenever I am in Antigua. The staff is wonderful and it’s always very clean and very mellow. The curtains on the beds really make it feel cozy. Best staff! Always very helpful with whatever you need. Shuttles, drivers, etc. LOVED Somos! It's quiet, clean, and close walking distance to everything you need in Antigua! It wasn't full either night I stayed here, so even though I was in a 6-7 bed dorm, only one other person was in there with me so it was even more quiet. I personally find quiet hostels to be better because I didn't hang out here during the day, I just came to sleep and it's perfect for that. 2 private bathrooms. Never got warm water, but clean bathrooms. Amazing how friendly and helpful the staff was. Good location, many showers, comfy beds with private lights, plugs and curtains. Spacious lockers, garden and terrace. Many good food places nearby and laundry 15m away. Nice hostel, the staff is really into making this place a nice experience! Not a party hostel but they can tell you where the party is. Everything is Clean...SUPER clean! Grocery store really close with lots of restaurant options as well! 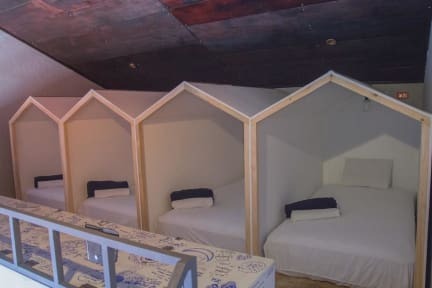 The bad: The WiFi was bad if you were not in common areas and as there are no doors you could hear everyone even if you were on the pods so that's bad. Second time here - clean, quiet, very friendly staff, comfortable beds. Only con is the location is a bit away from the center but that’s a minor thing. Hot showers also don’t always work but usually it’s fine. I had a great stay here to relax a bit. 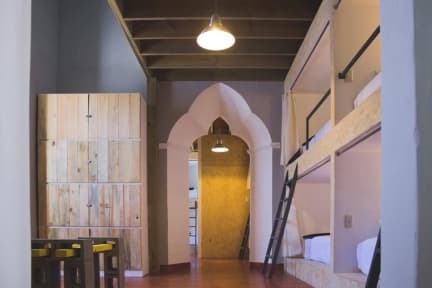 Pros: This is a great hostel if you want a place to relax for a few days. Super comfortable beds, very relaxed and quiet, friendly staff, good location. Cons: this definitely isn’t a social hostel as there’s not much of a common area, no bar, and everybody tends to sleep very early. Not the best place to meet people. That being said, I still enjoyed my time at this hostel as I just wanted 2 nights to relax and get some work done, so this place was perfect. Liked it here... Chilled vibes, super helpful staff, comfy beds, good location.